I’m one of those people who brings lunch almost every day. And since I am making lunch for me, I also make it for my husband. It kills me to spend $12 on a lunch that is neither as good nor as nutritious as what I can bring from home. And once you get used to doing it, you’ll find that it really doesn’t take that much time or effort. When my son was in school, he used to beg me to make lunch for him rather than having him buy it like the other kids. What mother could resist that? I later also found out that his friends used to offer to pay him for parts of his sandwiches! He swears to me that he never actually took advantage of this potential scheme to augment his allowance…. I love to bake bread when I can. Everything about it is appealing. I love the way the dough feels underneath my hands, when I am kneading it (I do NOT use a bread machine, but go ahead if you like) and the smell – oh that smell – and of course, the taste. And for me – it’s relaxing. It just says home to me. And even though I never bake with preservatives, homemade bread actually holds up better than store-bought bread. Go figure. 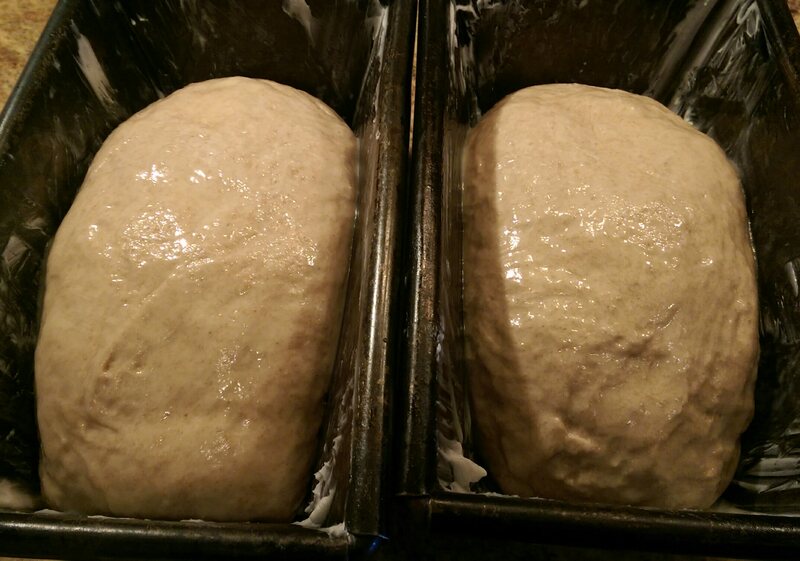 Today I am making two loaves of honey whole wheat bread. It makes wonderful toast and is also great for sandwiches. You can freeze one of the loaves for later or give it away to what is certain to be a grateful friend. My recipe comes from the Betty Crocker Bread Book, a slim volume that I have had on my shelf for about 30 years. There is no celebrity chef behind it, but I have made many breads from it over the years and they have all been delicious. It may be out of print, or replaced by a newer, sexier version. If you can find a good, clean used copy, I think it is worth getting. Warm your oven to the lowest possible setting (mine is 170 degrees F.) As soon as it comes to temperature, turn it off and leave the door closed. Warm a large bowl with hot water. My bowls always come out of the cabinet cold. Dissolve the yeast in 1/2 cup of warm water. Stir in the honey and allow it to proof for about 10 minutes. As soon as it smells yeasty and is bubbling, it’s proofed and you know that your yeast is good. Add the shortening, 1.75 cups of warm water, salt and the 3 cups of whole wheat flour. Stir well until the dough is smooth. Stir in enough all-purpose or bread flour to make the dough easy to handle. This will take a bit of practice and is dependent on temperature, room humidity and flour. Once you learn what it should feel like, you can make any bread. 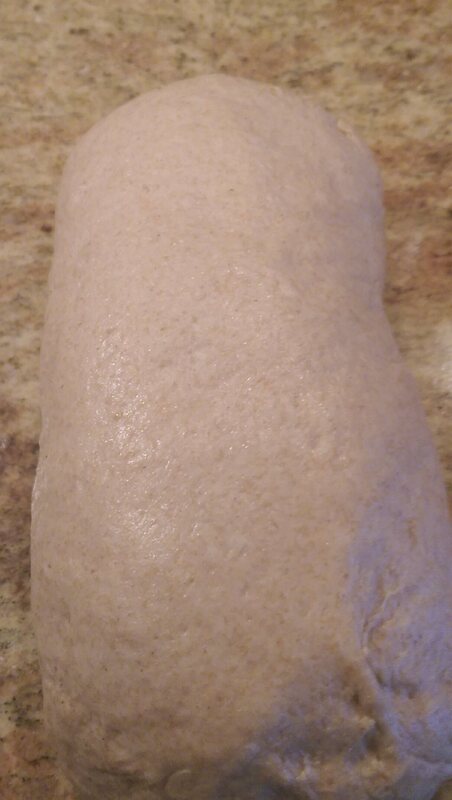 At this point, I like to let my dough rest, covered for about 10-15 minutes. I find that it allows the gluten to form and the flour to be properly absorbed and so you need to add less flour when kneading in the next step. It makes for a finer crumb in my opinion. Turn dough onto a lightly floured surface (use the all-purpose or bread flour for this) and knead it until it is smooth and elastic. This takes about 8-10 minutes. Place the dough in a greased large bowl and roll the dough around so that it is covered with the shortening or oil. Cover it with a tea towel or plastic wrap and place the bowl in the warmed oven to rise for about an hour. 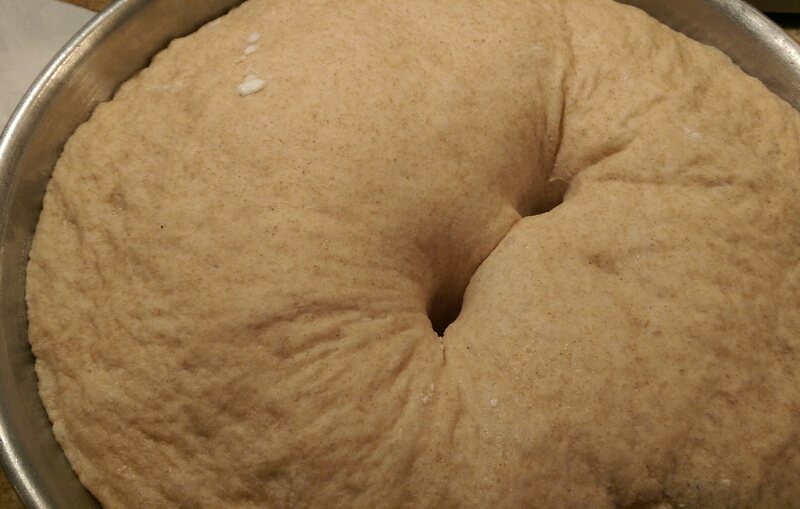 Dough is ready when an indentation remains when made with two fingers. Punch down the dough and using a bread scraper, divide the dough in half. If you must use a knife, use the back side of the knife (the dull side). If you want the loaves to be exactly the same size, use a scale to weigh the pieces. I’m not so inlcined and don’t mind a little difference, so I don’t bother. Flatten each half with your hands or a rolling pin into a rectangle, about 18 x 9 inches. Fold the dough crosswise into thirds, overlapping the two sides. Tightly roll the dough towards you, beginning at one of the open ends. Press with your thumbs to seal the dough after each turn. Pinch the edge firmly to seal. With the side of your hand, press each end to seal. Fold the ends under. Place the loaves seam sides down in 2 generously greased loaf pans. Brush lightly with melted butter, margarine or Crisco. Lightly cover the loaves with the tea towel or waxed paper and allow to double. This takes about 40 minutes to an hour depending on temperature and other factors. I have so many yeast spores in my apartment that mine rises fairly quickly. After 30 minutes, preheat your oven to 375 degrees F.
Place the loaves on the lowest rack so that the tops of th epans are in the center of the oven. Bake until the loaves are a deep golden brown and sound hollow when tapped with your knuckles or a wooden spoon – about 40 to 45 minutes. Remove the bread from the pans and allow them to cool on a wire rack. I wish you could smell my house!